The food pathogen testing market was estimated to be valued at USD 7.42 Billion in 2015. The market is projected to grow at a CAGR of 7.8% during the forecast period. The increase in outbreaks of foodborne illnesses, and stringent safety & quality regulations for food are the factors driving this market. The key players have been identified through secondary sources such as the Food & Drug Administration (FDA), the United States Department of Agriculture (USDA), and the Canadian Food Inspection Agency (CFIA), while their market share in respective regions has been determined through both, primary and secondary research. 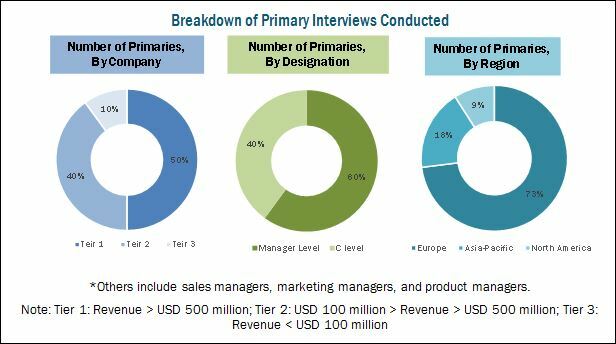 The research methodology includes the study of annual and financial reports of top market players, as well as interviews with industry experts (such as CEOs, VPs, directors, and marketing executives) for key insights (both quantitative and qualitative) in the food pathogen testing market. The various contributors involved in the value chain of the food pathogen testing market include R&D institutes, food pathogen testing service providing companies as SGS, Bureau Veritas, Intertek, Eurofins, pathogen testing equipment manufacturing companies, and government bodies & regulatory associations such as the United States Department of Agriculture (USDA), the Food and Drug Administration (FDA), and the European Food Safety Authority (EFSA). This research report categorizes the food pathogen testing market based on type, food type, technology, and region. The food pathogen testing market is projected to grow at a CAGR of 7.8% from 2015 to 2020, to reach USD 10.79 Billion by 2020. The market growth is driven by the changing consumer attitude and concerns towards safe and quality food, positive structural changes in food safety regulations, high occurrence of food pathogen incidents, and globalization of food trade. On the basis of food type, the market is led by the meat & poultry segment, followed by the fruits & vegetables segment. The contamination of food products is often observed during several stages in food supply chain, mainly processing, packaging, and storing. Food regulatory bodies have enforced food safety regulations to control the concerns related towards the safety of food products which drives this market. Salmonella testing dominated the global demand for food pathogen testing owing to the large number of foodborne outbreaks in food. Salmonella is one of the principal causes of foodborne illness worldwide, causing infections on large scale. It is followed by Campylobacter, which is projected to remain second-largest market by 2020. North America accounted for the largest share in the food pathogen testing market in 2014, due to an increasing number of food poisoning outbreaks and increasing consumer awareness towards food safety, Salmonella and Campylobacter are among the widely-tested pathogens in this region. The market in the Asia-Pacific region is projected to be the fastest-growing, with investments from several multinational food manufacturers, especially in countries such as China, India, and Southeast Asian countries. The demand is driven due to stringent food safety regulations and the growing volume of trade between Asia-Pacific and rest of the world. Lack of food control systems, technology, infrastructure & resources in developing countries are the factors restraining the market growth for food pathogen testing. Key market players such as SGS S.A. (Switzerland), Bureau Vertitas S.A. (France), Eurofins Scientific (Luxembourg), and Intertek Group Plc (U.K.) are focusing on expansion through business establishments in key market regions. Acquisitions are also a part of strategic moves adopted by key players to gain a significant share and increase their presence in key markets. Industry players are also focusing on new service launches so as to avail a competitive advantage through combined synergies. 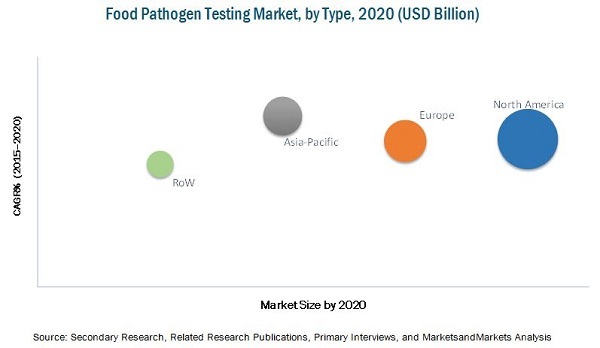 The food pathogen testing market has witnessed an increase in demand, especially in developing nations such as India, China, and Southeast Asian countries. 12.11 Genetic Id Na Inc.